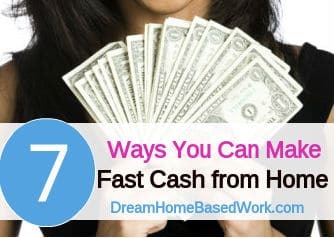 Looking to earn fast cash from home? Or maybe perhaps earn money back from your next grocery bill? On this page, you will find some ways you can get paid fast cash in your spare time. Call Center QA is a company that offers telephone mystery shopping work from home. You will be completing calls to various call centers asking about specific products or services as described in the call assignments when they are sent out. You are able to be very flexible with your schedule. This position is open to U.S. residents ONLY, who are very fluent in English. The pay is $5-$10 per each successful call. This company has a good reputation of making fast cash payments via Paypal. Go here for more info! Whatusersdo is a usability testing site that needs website testers to visit various websites and give your feedback. A test usually takes around 10-15 minutes to complete. The pay is around $8-$15 for each completed test, You will receive fast payments paid via Paypal. This is a work from home opportunity that is open worldwide. Clickworker is a global company that pays you to complete short online tasks. They offer various work projects – anything from proper writing to internet research. The work does not involve a phone, all you will need is a computer with internet access. The pay depends on the type of tasks you complete. Clickworker says you can make around $9 per hour, but that really varies for different projects. This site is open to those worldwide. Ibotta is an app, similar to Checkout 51, that pays you back for items you purchase at the grocery store. Ibotta helps you save on hundreds of your favorite brands, which makes it possible for you to earn a little extra income off your purchases as well. This company makes instant payments directly to your PayPal account within 5 minutes. You can also earn from your friends and family you refer to Ibotta. Fiverr is an online marketplace that is referred to as a “micro job” site that pays for every task you complete. You can do almost anything on this site from website designing, writing, video animation, or something really unusual like holding a sign. The good thing about this site is you are paid before completing any type of work and can set our own terms and conditions. The bad thing is after Fiverr reduce their fee, you are actually paid a little under $4 which is not much for most. This just a way to make extra cash from home. Slice the Pie is a site that pays you to listen to music and rate/review it. You’ll get paid anywhere from six to seventeen cents for every song you review. It only takes 90 seconds to review a song. They send payments out on Tuesdays and Fridays and you must have a minimum of $10 to withdraw your earnings. This is a great way for teens and college students to earn extra money online. Transcribe Me a site where you can sign up to transcribe audio files. They pay new transcribers $20 an audio hour (remember this is quite a bit longer than a regular hour). You are able to get started with no prior transcription experience, you just need to take a few short exams before you get started. Don't worry you are able to retake them if you fail the first time. You are able to cashout via Paypal with only a $1. Go here to more details! 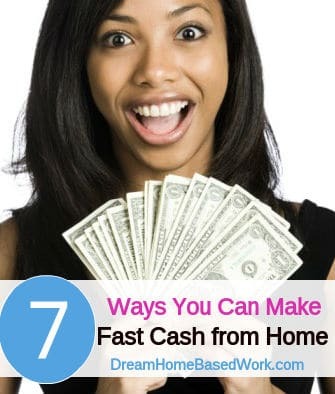 There are many other ways to make extra money from home. With any luck, you’ll be on the road to making hundreds! Feel free to share your own ideas by leaving a comment below. I am going to share my experience with six of the above options for making cash from home. Call Center-QA – Got paid quickly. Only did three phone shops for them about a year ago. Was told they would contact me when more work comes in. To my knowledge never received another email for more work. They wanted me to write a positive rating on Facebook. So I don’t know if it is a situation like we give you work once, you write a positive review and we never use you again. Clickworker – Never any available work. Post Loop – Couldn’t get enough positive response to get points. ibotta – The products that they were promoting for payment I don’t really use. Fiverr – Have never gotten any results from. Slice the Pie – You have to make sure that you use the correct wording to get you response or feedback approved for payment.